Nearly all days on the water are amazing but every now and then you have a once in a lifetime adventure. This was the case for us a few days ago. We awoke early in San Nicolás to find two dolphin swimming just a few feet off our starboard beam. It’s always a treat to see dolphin and watching them play at sunrise is no different. After a brief encounter with the dolphin we loaded the dink on the forward deck and prepared for our 30+ mile journey north to Santo Domingo at the mouth of Bahía Concepción. It was a beautiful morning with 10-12 knot winds so we hoisted the sails, shut down the engine and enjoyed our morning coffee as we glided through the blue green waters of the Sea of Cortez. There is something so soothing and peaceful when your boat is running six knots and the only sounds you hear are the water splashing along side of the hull and the wind across the sails. We had a lovely morning sail before the winds died off, the seas turned to glass and we had to fire up the engine. A longer sail would have been nice but hey, we were still on a boat in paradise. It’s hard to find anything bad to say about it. It wasn’t long before we had visitors flying about the boat. Four brown Boobies began swooping around the bow attempting to land on the pulpit. After multiple attempts one finally landed on the rail. Within minutes all four had successfully landed and were enjoying a ride on the good ship Dazzler. I went to the bow to get a closer look and snap a few pictures. They absolutely showed no fear. They even let me get on the pulpit with them. Every so often one would lose its footing and fly off but soon he’d return. There was one that was a bit bossy. We named him Jefe (boss). When others would try to land he would squawk at them and flap his wings to prevent them from making a successful landing. When they swooped in to land the tips of their wings brushed my shoulders. That’s how close they let me get. I could literally look directly into their sparkling grey blue eyes. It was so awesome to be so close to these birds. Just about the time I was getting used to the Boobie family being aboard I looked off the port bow to see a large pod of dolphin heading our way. I grew up on the water in Bradenton, Florida and I’ve seen thousands of dolphin in my life but there is something absolutely magical about seeing a few hundred dolphin all at once. So here we were cruising and we had Boobies on the bow and dolphin in the water. I was thinking to myself that life just doesn’t get much better than this. The dolphin didn’t linger too long, They were just passing through on their way to some other watery locale but I was grateful for their visit. I left the Boobies on the bow and retreated to the cockpit to study my Spanish. A half hour or so went by when Dan saw something in the water about a mile off the port beam. It was a large black fin sticking above the water. Instantly he knew…it’s an Orca! He pulled the wheel hard to port and off we went to see them. I could barely contain myself. Of all the animals we could encounter in the sea, the Orca topped my list of “wants”. Before long we had five or six of these magnificent creatures swimming along side of Dazzler. I was so giddy with excitement I was like a kid on Christmas morning. Each time they surfaced I giggled and screeched with pure joy. 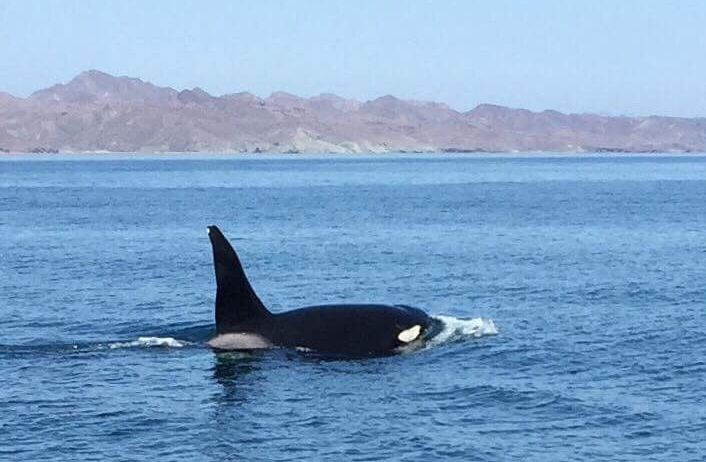 Dan and I were on the bow taking pictures and video of our new friends when a juvenile Orca about fifteen feet long separated from the pod and came swimming right toward our bow. Before we knew it he was riding the wake on our bow like a dolphin would do. Oh my God! This was a sight to behold. I can’t even explain the level of excitement we felt. The next thing we knew he is swimming upside down under the keel. We could see the white of his underside as he went from side to side. He came up along side of the boat, surfaced and shot water out of his blowhole all over us and the boat! Never in my life did I dream I would get sprayed by an Orca in the wild! THIS IS AWESOME! My very best day ever! We’ve posted a video of our day filled with wildlife on YouTube…Click on the link below to view it. Hope you enjoy it as much as we did. Click Here to See Our “Perfectly Wild” Video With Birds, Dolphin & Orcas! Just so happy for you and love reading about your adventures! Thanks Susan. Having the time of my life. I wish I had internet more often because I have lots to post about. I’m trying to get a couple of articles up while we are here in Santa Rosalia. Amazing is an understatement…thanks for sharing this with us!! !